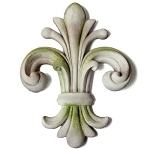 Fleur De Lis and sometimes spelled Fleur De Lys. Comes from an old French word meaning flower lily. It has a great history in many cultures. Has been used by royalty and the emblem on flags. It's shape has harmony and balance, which makes it an attractive symbol. It appears on many home & garden items today. 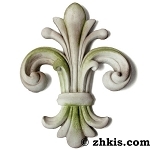 Here you'll find it on wall sculptures - garden finials - wall hangings and many other decorative items for your home.